Pack; loop , telegraph set using a regenerative receiver and Hartley oscillator transmitter. Can be carried by two men. Used by Sig.C, INF, AF. Frequency range Transmitter : mc. Pack; loop telegraph set using a regenerative receiver and Hartley oscillator transmitter. Can be carried by two men. Ground, transportable; intended for command communication use between Division Headquarters and Brigade and Regiments. Transported by vehicle. Ground transportable; used between tactical field units. It's transported in vehicles or cargo aircraft. Ground, transportable; used between tactical field units. Carried in vehicle or cargo aircraft. Limited Standard. Used by Sig.C, CAC, TD. Frequency range Transmitter: 0.4-4.0 mc. Ground transportable; used between tactical field units and as a ground set in ground-to-plane communication. It's transported in vehicles or cargo aircraft. Ground, transportable; used between tactical field units and as ground set in ground-to-plane communication. Two receivers. Transported by vehicle or cargo aircraft. Used by Sig.C, AAF, CAC, TD. Frequency range Transmitter : 0.4-4.0 mc. 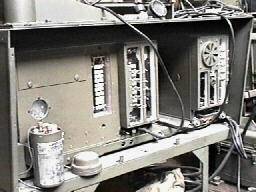 Radio set SCR 178 is a ground transportable radio set, intended for point-to-point ad ground-to-plane communication between artillery units and aircraft observation purposes. Replaced by SCR 608, 609, 610 and 628. Used by Sig.C, AAF, FIA. Frequency range : 2.4 to 3.7 mc. Pack; same as SCR-178 except carrying cases have pack saddle hangers for transportation by animal. Frequency range : Transmitter 1.5 to 12.5 mc, Receiver 1,5 to 18,0 mc..
Power output : 75 Watt. Ground, transportable; used for ground-to-ground, or ground to-air communication. Intended for semi-fixed use inside of buildings where commercial AC power is available, can be operated in an emergency from the gasoline engine driven generator supplied. Control Unit RM-12 and Control Unit RM-13 are components of Remote Control Equipment RC-47. 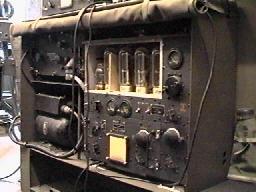 All components of RC-47 are supplied with this radio set. Can be remotely controlled over 5 Mi. of Wire W-101-B. Transported by vehicle or cargo plane. The various models of the set are adapted for installation and operation in different types of vehicles, including scout cars, combat cars, command trucks, etc. Used by Sig.C, AF, CAV, ENG. Frequency range : Transmitter 1.5 to 6.2 mc, Receiver 1,5 to 18,0 mc.. Pack; walkie-talkie, provides communication over relatively short distances. Two tube transceiver consisting of modulated oscillator/super regenerative detector and modulator/audio amplifier. Used for training purposes and special projects. Limited Standard. Replaced by SCR-609 and SCR-610. Used by Sig.C, AF, ENG, FA. Frequency range : Transmitter mc, Receiver mc.. Ground, mobile; high power radio station. For use at an Air Force base or with large field units. Transmitter Installed In Truck K-18. 3 receivers, plus monitor, installed in Trailer K-19 . Switch selection of master oscillator or any one of five crystal frequencies. Provision for installation of telephone switchboard, teletype and typewriters in trailer K-19. Transmitter can be remotely controlled using voice, tone or CW operation up to a distance of 7-1/2 Mi. of Wire W-110-B. Limited Standard. Used by Sig.C, AAF, AY, INF. Pack; low power short range highly portable command set designed to clamp on a Phillips Pack Saddle for animal-pack transportation and operation. Limited standard. Used by Slg.C, CAV, FA. Vehicular; for use in combat and scout cars equipped with a 12 volt, 180 ampere-hour storage battery and a 50-ampere generator. Limited Standard. Replaced by SCR-508 and SCR-528. Vehicular; receiver only; for use In Signal Corps school and Armoured Force replacement training center or for installation in any vehicle requiring a separate receiver. Limited Standard. Radio set SCR 244 consists of a superhetrodyne receiver and a external power supply unit. The receiver uses a conventional circuit and is designed for the reception of c-w, a-m, or tone signals with either manual or automatic control. Primarily intended for fixed-station use, although mountings for vehicular installation may be utilized. Frequency range : 0,54 to 20,0 mc..
Vehicular; for providing communication between stationary or moving vehicles equipped with a 12-volt, 180 ampere-hour storage battery with a 50-ampere generator. Tuning unit TU-25-A, covering frequency range 3.5 to 5.25 Mc, issued only to Cavalry. Switch selection of master oscillator or any one of four crystal frequencies. Replaced In Armoured Force by SCB-508 or SCR-528. Used by Sig.C, AF, CAV, FA, INF. Radio set SCR 281 consists of an a-m radiotelephone transmitter and receiver designed for operation on coastal and harbor vessels or in land stations for communication with such vessels. 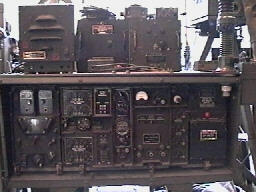 This set cannot be used for radiotelegraph transmission or reception. Frequency range (transmitter & receiver): 1,7 to 2,75 mc..
Radio set SCR 284 is a command set to be used either in a vehicle or on the ground for communication principally between Rifle Regiment and its Battalion in the various phases of combat. For pack operation, carried as a three man load. When used as a ground, transportable set it may be desirable to supply a 6Volt storage battery for operation of power converter PE-104 rather than to operate hand generator receiving. The installation is replaced by SCR-694. Used by, Sig.C. CAC, FA, INF. Special thanks to Paul Thekan for the lid. Pack and ground, transportable; carried in a vehicle or as a two man load. Temporary replacement for SCR-l3l, SCR-161 and SCR-171. Limited Standard. Used by Sig.C, FA, INF. Frequency range (transmitter & receiver): mc..
Radio set SCR 293 is a short range vehicular set designed to provide two-way fm voice communication between mobile units. This set was developed particularly for use in light tanks and scout cars. Radio receiver BC-499 used with this set is an 11 tube, crystal controlled, 5 channel, fm, superheterodyne receiver, and is designed for the reception of fm signals of the type generated by Receiver and Transmitter BC-500. Frequency range : 20 to 27.9 mc. Vehicular; receiver only of SCR-293. Installed in tank and scout cars. The preset channels are limited to adjacent 100kc. channels which may be selected by a switch inside of the receiver. Limited standard. Radio set SCR 293 is a fm, 25 watt set designed for installation and operation in a vehicle, and provides 2-way voice communication. Vehicular; commercial police car set designed for two-way communication. Used by umpire personnel. Substitute standard. Frequency range : 20 to 28 mc. Replaced by SCR-399 and SCR-499. Used by Sig.C, AAF, CAV, FA, INF. Radio set SCR 300 consists of an 18-tube, low power, dry battery operated portable radio receiver and transmitter. It is designed for fm, two way communication over short distances. It is primarily intended as a walkie-talkie for foot combat troops. The complete station weight is almost 40 pounds. Pack; designed primarily for “back-pack” or “on-ground” operation, providing two-way communication over short ranges . The short whip antenna gives less distances range than the half-wave whip. Ground plane Antenna Equipment RC-291 is available for use with this set for increasing the distance range obtained by virtue of the increase in antenna height. Frequency range : 40 to 48 mc. Ground, mobile; high power radio station for providing communication either from a stationery position or while moving at relatively high speeds over rough roads. Installed in Shelter HO-l7 combined with power plant normally carried in cargo trailer K-52. Shelter HO-17 may be mounted on a 2-1/2 ton 6 x 6 cargo truck (not a component) for vehicular operation, or on level ground for fixed operation. May be remotely controlled up to a distance of one mile using the two Telephones EE-8 and Wire W-110-B supplied. The remote control equipment provides for remotely keying or voice modulating the transmitter , remotely listening to Receivers BC-312 and BC-342 and communicating with the operator in the radio station who assists in the foregoing operations. A noiseless portable typewriter is included. A half-wave doublet antenna kit is included for improving sky wave transmission, thus increasing the range and reliability of operation when at a fixed location. Frequency conversion kit MG-509 is available to extend the transmitter frequency range down to 1.0 Mc. Used by Sig.C, AAF, AF, CAV, FA, IBF. Rx 1.5 to 18 mc. Air transportable; high power radio station similar to SCR-399, except no shelter or trailer provided and components are packed for transportation by air. May be remotely controlled up to a distance of one mile using the two Telephones EE-8- and Wire W-110-B supplied. The remote control equipment provides for remotely keying or voice modulating the transmitter, remotely listening to receivers BC-312 and BC-342 and communicating with the operator in the radio station who assists in the foregoing operations. A noiseless portable typewriter is included. A half-wave doublet antenna kit is included for improving sky wave transmission, thus increasing the range and reliability of operation of this radio set. When installed in a 1/4 ton, 4x4 truck Antenna Equipment RC-293 (end fed 3/4 wave) is supplied, which together with counterpoise CP-15, is used instead of doublet kit . Frequency conversion Kit MC-509 is available to extend the transmitter frequency range down to 1.0 Mc. Used by Sig.C, AAF, AF,CAV, FA, INF. Vehicular; command radio set, designed for installation in tanks, amphibian cars, personnel carriers and cars to provide communication between these vehicle and airplanes or base stations. Used by Sig.C, AF, CAV, ENG, FA, TD. Frequency range : 2.0 to 4.5 mc. Radio set SCR 508 is designed for installation and operation in combat vehicles such as tanks, scout cars, half-tracks, command cars, or any other authorized vehicle. This set consists basically of Radio transmitter BC-604 and two Radio Receivers BC-603. Radio transmitter BC-604 operates on 10 preset frequencies. Interphone control box BC-606 provides separate control and connection facilities for a microphone and a headset. Several control boxes may be connected in multiple, if desired. Radio set SCR 508 is very similar to Radio set SCR 528, main difference is that Radio set SCR 508 consists two receivers BC-603. Frequency range : 20.0 to 27.9 mc. Radio set SCR 509 is a low power, dry battery operated, fm pack designed for two way voice communication over short ranges. Use: Portable pack set for armoured units, Field Artillery, and infantery. Frequency range : 20 to 27 mc. Pack and vehicular; low power. Same as SCR-509 with additional components for use with 6-volt or 12-volt vehicular storage battery and equipped with shock mounts for mounting in a vehicle. Packed and vehicular; for operation from dry battery or storage battery. Installed In vehicle or carried as guidon by man on horseback or (using dry battery) as one man load. When used with PE-157, the self-contained 2-volt storage battery can be recharged from a 6-volt or 12-rot storage battery. Spare tuning unit carried in chest unit and is readily available for a quick frequency change. Used by Sig.C, CAV, ENG, INF. Radio set SCR 528 is designed for installation and operation in combat vehicles such as tanks, scout cars, half-tracks, command cars, or any other authorized vehicle. This set consists basically of Radio transmitter BC-604 and Radio Receiver BC-603. Radio transmitter BC-604 operates on 10 preset frequencies. Interphone control box BC-606 provides separate control and connection facilities for a microphone and a headset. Several control boxes may be connected in multiple, if desired. Radio set SCR 528 is very similar to Radio set SCR 508, main difference is that Radio set SCR 508 consists two receivers BC-603. Pack; very short range "Handle-Talkie'. Lightweight, self-contained two-way voice audio set for parachute troops. Vehicular; receiver only of SCR-528 plus a separate interphone amplifier. Installed in tank and armoured car. Interphone amplifier provides communication for personnel in installation where noise level is high. Use: fixed or vehicular radiotelephone communication. Frequency range : 1.68 to 4.45 mc. Power output : 45 Watt. Radio set SCR 593 is a self contained, push button controlled radio receiver, designed for portable or vehicular operation. Use: reception of alert or warning messages. Frequency range : 2 to 6 mc. Radio set SCR 607 consists of radio receiver BC-787, which is a three band superhetrodyne receiver designed for mobile or fixed station use. The set is designed for interception and monitoring use, remote control may be used for stand-by reception. Frequency range : 27.8 to 143 mc. Radio set SCR 608 is designed to provide fm radio telephone facilities. It may be installed an operated in combat vehicles such as tanks, scout cars, half tracks, command cars, or any other authorized vehicles. Use: Armoured combat vehicles and tactical ground units. Frequency range : 27.0 to 38.9 mc. Power output : 20 Watt. Radio set SCR 609 is a low power fm set which is designed to provide two-way communication over short distances from a stationary ground position. Power for the operation of the units is supplied by dry batteries. Radio set SCR 609 may be converted to radio set SCR 610 by adding the components necessary for vehicular mounting and operation. Use: Battery fire control from observation posts or liaison planes. Also general between vehicles. Power output : 1,3 Watt. Radio set SCR 609 is a low power fm set which is designed for installation and operation in vehicles and to provide two way communication over short distances. 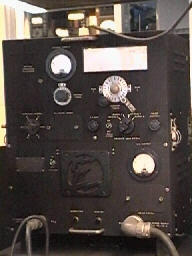 Radio set SCR 614 is a lf communication set used for intercept purposes. The principal components of this set are the radio receiver BC-969. 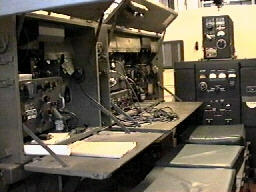 Radio set SCR-614 may be operated on ground as a fixed station or installed and operated in vehicles. Frequency range : 0.015 to 0.15 mc. Radio set SCR 616 is a superheterodyne receiver. Separate antenna inputs and rf sections for each band are incorporated in the receiver. The antenna consists of two biconical dipoles, one for each frequency band. Frequency range : 145 to 600 mc. 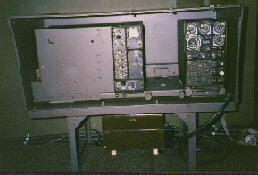 Radio set SCR 609 is a low power fm set. Although designed for field operation, the set may be operated from a 6, 12, or 24Volt vehicular supply system with modification in the use of components. The set may be operated by untrained personnel, may be quickly and easily changed to various types of operation, and is adaptable to emergency use is close combat areas. Power output : 1,5 Watt. Air transportable; for ground-to-plane, or ground-to-ground communication. Control Box BC-ll75 is used for master control and channel selection at the set. Control Box BC-ll75 provides send-receive control and channel selection at a remote point up to 500 feet from the station. Control Box BC-1176 provides only send- receive control from remote point up to 2 mi. over telephone lines. The control boxes also provide connection for land-phone communication between any two of the three locations utilizing Telephone EE-8. 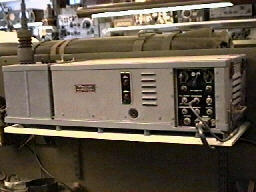 similar to SCR-522 and SCR-542 airborne sets except for power source and additional equipment for ground use. Radio set SCR 628 is designed to provide fm radiotelephone facilities. It may be installed and operated in combat vehicles such as tanks, scout cars, command cars, or any other authorized vehicles. Use: Armoured combat and other vehicles. 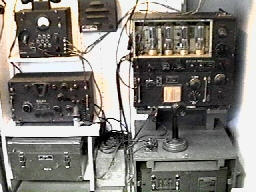 Radio set SCR 678 is an fm, general purpose, vehicular radio receiving set. Use: General purpose fm reception and monitoring use. Used is signal installation and maintenance units. Radio set SCR 694 is a light weight, low power, man-transportable, front line command set which provides two way radio telephone and telegraph communications. It can be used as a portable field set or installed and operated in vehicles. Radio set SCR-694 is particularly adapted to amphibious or jungle operation. Frequency range : 3.8 to 6.5 mc. Power output : 2-17 Watt. Pack; ground, transportable; and vehicular; provide communication for parachute troops. Switch selection of master oscillator or either of two crystal frequencies. Transported by vehicle or man pack. Limited production. Radio set SCR 704 consists of a superheterodyne receiver and an external power supply unit. The receiver uses a conventional circuit and is designed for the reception of cw, am, or tone signals, with either manual or automatic control. Primarily intended for fixed station use, however vehicular installation may be made. Frequency range : 1.25 to 40.0 mc. 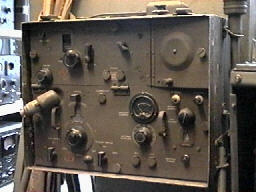 Radio set SCR 808 is an fm vehicular set intended for use in mobile Coast Artillery batteries and Military Police units. The set uses two Radio Receivers BC 923 and one Radio Transmitter BC 924, and is provided with four sets of tuning controls and four preset channels. The transmitter has a low-power output, providing line of sight communication. A crystal calibrator is provided in the receiver for calibration of both the transmitter and receiver. Frequency control : Crystal calibrated, master oscillator. 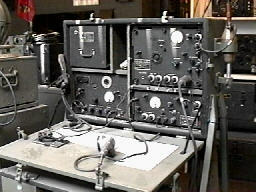 Radio set SCR 828 is an fm vehicular set intended for use in mobile Coast Artillery batteries and Military Police units. The set uses one Radio Receivers BC 923 and one Radio Transmitter BC 924, and is provided with four sets of tuning controls and four preset channels.